This list provides an overview of books about vocal technique, including the mechanics and the art of singing. 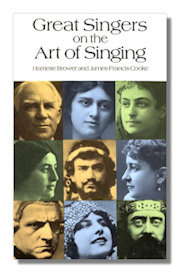 Great Singers on the Art of Singing. Harriette Brower, with James Francis Cooke (Editor). Dover Publications. 1997. ISBN 0486291901 (paperback). Compilation of instruction and advice from famous opera singers. Includes contributions from Caruso, Farrar, Gluck, Galli-Curci, Garden, Lehmann, Melba, many more. Includes 24 photographs. How to Sing. Lili Lehmann, with Richard Aldrich (translator). Dover Publications. 1993. ISBN 0486275019 (paperback). One of the most influential of all singing guides by one of opera's first international superstars, offering inspiration and sound advice in every phase of singing, from how to breathe correctly and produce a ringing head tone to role interpretation. Of special interest: Mme. Lehmann's recommended vocal exercises and guidelines for proper care of the voice. On Studying Singing. Sergius Kagen. Dover Publications. 1968. ISBN 048620622X (paperback). Discussed: erroneous theories, basic aims, techniques, abilities, more. 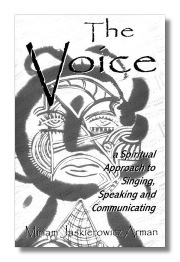 The Voice: A Spiritual Approach to Singing, Speaking and Communicating. Miriam Jaskierowicz Arman. International Academy of voice and stage. 1999. ISBN 0967418100 (paperback). For the first time, the "giro", the turn of the voice, which keeps the voice on top (perfectly in pitch and perfect vibration), without register imbalance and without laryngeal movement, is described so that anyone can follow. Each chapter brings you back to the beginning concepts and the clarity of explanation of finding the correct place to put the voice is simply uncanny. I read a pre-production copy of this and was frankly amazed. Appropriate for singers, professional or novice, teachers, and people who have serious speaking problems. 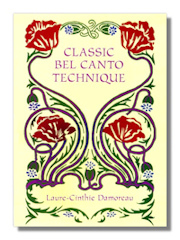 Bel Canto: A Theoretical and Practical Vocal Method. Mathilde Marchesi. Dover Publications. 1970. ISBN 0486223159 (paperback). Method book. Topics: Voice control, agility, breathing, posture, attack, style, interpretation, voice conservation. Includes 107 pages of practical exercises. Former students include: Calve, Melba, Eames, Alda. 126 pp. Classic Bel Canto Technique. Laure-Cinthie Damoreau. Dover Publications. 1997. ISBN 0486299848 (paperback). Exercises for attaining breath control, vocal sheen, eveness of tone and agility. Studies for scales, turns nad trills, vocalises, solfeggio studies, more. Writen by the noted French soprano (also known as Laure Cinti-Damoreau (1801-1863). Bel Canto for the 20th Century. Weldon Whitlock. Pro Musica Press. 1969. ISBN 1887117008 (hardcover). Presents teaching techniques in the "bel canto" tradition, with special emphasis on the passaggio. Elements of Vocal Science. Richard Mackenzie Bacon, with Ed. E.V. Foreman. Pro Musica Press. New edition, 1999. ISBN 1887117067 (paperback). First published in 1824, this is a series of highly informative essays on Italian and British singing of the early 19th century. Volume I in the series "Masterworks on Singing.". 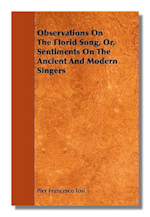 Observations on the Florid Song, or, Sentiments on the Ancient and Modern Singers. Pier Francesco Tosi. Kessinger Publishing (hardcover), Brousson Press (paperback) or Dodo Press (paperback). 2009. ISBN 1887117016 (hardcover), 1444623060 (paperback), 1409930467 (paperback). Pier Francesco Tosi (c1653-1732) was a castrato singer, composer, and writer on music. He began his career singing in church choirs as a boy and young man. He sang in a Rome church, 1676-7, belonged to Milan Cathedral choir from 1681 until his dismissal for misconduct in 1685, made his one recorded appearance in opera at Reggio nell'Emilia in 1687, in Giovanni Varischino's Odoacre, and was based in Genoa before going in 1693 to London, where he gave weekly public concerts and taught. From 1701 to 1723 he travelled extensively as musical and diplomatic agent of Emperor Joseph I and the Elector Palatine. From 1724 he again taught in London for some years; sometime before 1681 he had become a priest. Although he composed a number of cantatas and arias, he is best known as the author of Opinioni de' Cantori Antichi e Moderni (1723), a treatise on singing. This was translated into English as Observations on the Florid Song by Johann Ernst Galliard in 1742 and into German as Anleitung zur Singkunst by Johann Friedrich Agricola in 1757. Teaching the Mechanical Art of Song. Celeste Reese Watson. Pro Musica Press. Reprint, corrected and revised, 1999. ISBN 1887117075 (paperback) or ASIN B0006WFRRS. Mrs Watson presents the most basic approach for the beginning voice student in common sense and easy to understand terms. Transformative Voice. Edward V. Foreman. Pro Musica Press. 1999. ISBN 1887117105 (paperback). Dr Foreman presents a unique approach to the voice as the most direct means to personal transformation. Companion to "Voice Without Technique.". Voice Without Technique. Edward V. Foreman. Pro Musica Press. 1999. ISBN 1887117113 (paperback). Contains the exercises to carry out the simple and direct realization of vocal potential outlined in "Transformative Voice." . The Art of Singing. Enrico Caruso, with Tetrazzini, Luisa. Dover Publications. 1975. ISBN 0486231402 (paperback). Two of the greatest singers discuss all that can be taught about the art of singing; breathing and breath control, mastery of the tongue, voice nad tone production, facial expression and mirror practice. Caruso's Method of Voice Production. P. Mario Marafioti. Dover Publications. 1981. ISBN 0486241807 (paperback). 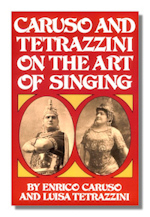 This historic volume explains how the great tenor achieved his phenomenal voice production. Replete with practical instruction and advice for aspiring singers, this book is also a fascinating document of musical history. 352 pps. Caruso and the Art of Singing. Salvatore Fucito, with Beyer, Barnet J. Dover Publications. 1995. ISBN 0486284565 (paperback). Fucito, who was Caruso's vocal coach and accompanist from 1916 to 1921, chronicles the tenor's legendary musical career, analyzes and describes his breathing technique, tone production, practice sessions, style and repertory. With 46 fully noted vocal exercises. 224 pp. Hints to Singers. Lillian Nordica. Dover Publications. 1998. ISBN 0486400948 (paperback). Selecting the right teacher, developing confidence, overcoming stage fright, and many other important skills receive thoughtful discussion in this guide. Nordica ( 1857-1914) was a famous diva. 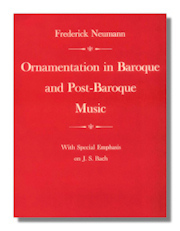 Ornamentation in Baroque and Post-Baroque Music, with Special Emphasis on J.S. Bach. Frederick Neumann. Princeton University Press. 1977, 1983. ISBN 0691091234 (hardcover), 0691027072 (paperback). Ornaments play an enormous role in the music of the seventeenth and eighteenth centuries, and ambiguities in their notation (as well as their frequent omission in the score) have left doubt as to how composers intended them to be interpreted. Frederick Neumann, himself a violinist and conductor, questions the validity of the rigid principles applied to their… More performance. In this controversial work, available for the first time in paperback, he argues that strict constraints are inconsistent with the freedom enjoyed by musicians of the period. This little 26 page booklet is very handy and contains clear, brief explanations of terms. L'Art du chant. Jean-Baptiste Berard, with Trans. Sidney Murray. Pro Musica Press. Reprint, revised and corrected, 2001. ISBN 188711713X (paperback). The most significant treatise on the authentic way to perform the French operatic music of Lully, Charpentier, and Rameau, by a singer who was in many of Rameau's premieres. Concerning the principles of Voice Training During the A Cappella Period and Until the Beginning of Opera (1474-1640). Bernhard Ulrich, with Trans. John W. Seale. Pro Musica Press. Reprint, revised, 1999. ISBN 1887117059 (paperback). The most significant study of the original sources for this period, with discussions and comparisons of vocal techniques and training methods.